Diversity Worldwide: 800 described species in about 84 genera. Estimated total of 4000 species worldwide. Trichogrammatidae contain some of the smallest insects with a total adult length ranging from a paltry fifth of a millimeter to 1.5mm. Biology Parasitoids of eggs of other insects (most commonly Hemiptera, but Coleoptera and Lepidoptera eggs are also parasitized). Foerster, A. 1851. Eine Centurie neuer Hymenopteren. Vierte und fünfte Dekade. Verhandlungen des Naturhistorischen Vereins der Preussischen Rheinlande und Westfalens, Bonn 8: 1-42, 1 plate. Pinto, J.D. & George, J. 2004. 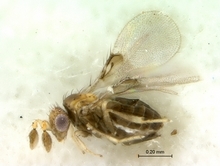 Kyuwia, a new genus of Trichogrammatidae (Hymenoptera) from Africa. Proceedings of the Entomological Society of Washington 106: 531-539. Photographs © Simon van Noort (Iziko Museums of South Africa) or © Stefania Laudonia & Gennaro Viggiani (University of Naples Federico II).